Let's consider the inverse problem when I need to transfer velocities from particles to the grid (inverse bilinear interpolation). 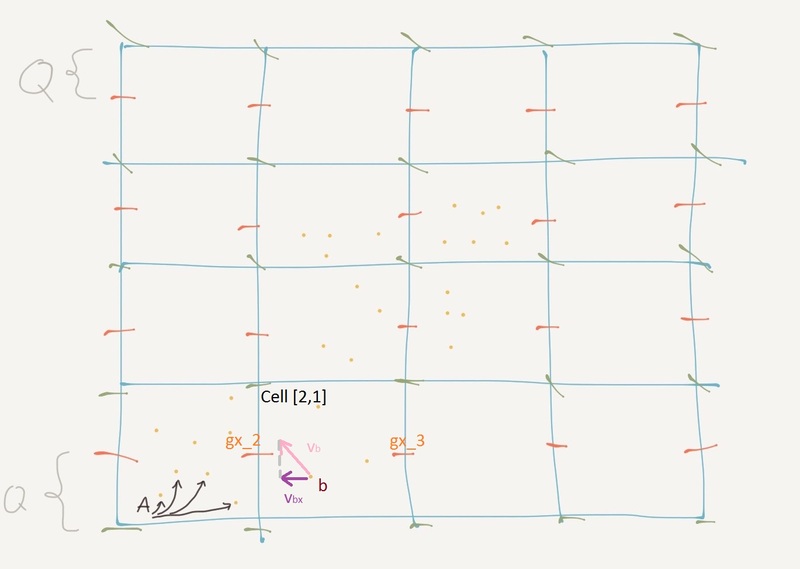 How'd I transfer a particle's x-velocity to the velocities located at cell's face in the Q region? Would the particle's velocity be distributed among the 2 face-velocities (as opposed to 4 face velocities in non-boundary locations)? 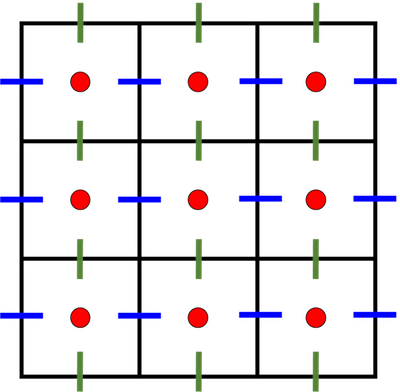 The problem with these array's sizes is interpolation of velocities at the grid boundaries – imagine you'd want to interpolate the (blue) x-velocity (from the 3x4 array) for particles that are located in the lower half of the bottom cells (the lower half of a cell is the part of the cell, that is below the blue bar representing x-velocities - take a look at the second image below – it's the area marked as Q). When I'd want to interpolate the x-velocity in the center (non-boundary) cells, everything would be OK – I'd choose 4 nearest (blue) velocities for a given position in the grid and based on the 4 velocities, I'd bilinearly interpolate the velocity. The obvious fix would be to store the velocities on grid's verticies instead of on faces. The velocity for a face could then be linearly interpolated from 2 neighboring verticies when needed. Is this the conventional/preferred/best way how to solve interpolation of velocities on staggered grid? 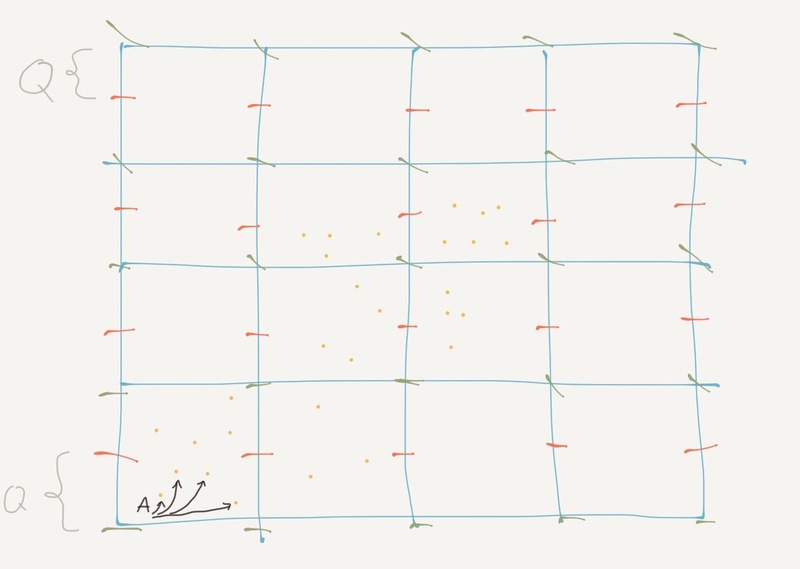 For the fluid->particle problem, @AbhilashReddyM gave you the answer, the boundary condition will give you the value of $v_x$ at the boundaries. For the particle->fluid problem, yes, it is a boundary condition that you need to use, but not necessarily the one of your fluid problem: e.g. if particles are allowed to slide/roll against the boundary while the fluid obeys no-slip condition, then you have a different BC for each. Note that for clarity, you should have asked questions separately. Not the answer you're looking for? Browse other questions tagged finite-difference interpolation navier-stokes grid or ask your own question. interpolation combined with methods of characteristics can cause oscillations for the transport equation?